FilmMaker Drupal 8 Theme Movie Production – Video Blogger – Creative Agency Created by megadrupal. This templates have specific characteristics, namely: FilmMaker has features such as High Resolution: Yes, Compatible Browsers: IE9, IE10, IE11, Firefox, Safari, Opera, Chrome, Edge, Software Version: Drupal 8.2.x, Drupal 8.1.x, Drupal 8.0.x, Columns: 4+ . 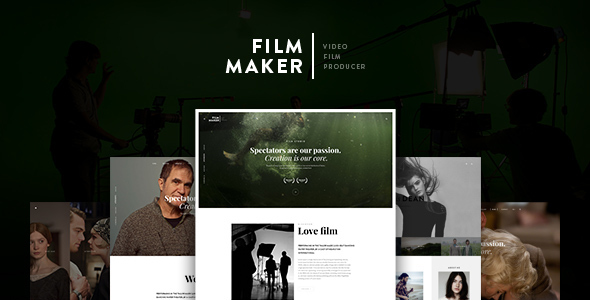 You can use this FilmMaker Drupal 8 Theme Movie Production – Video Blogger – Creative Agency on Cms themes category for creative agency, film, Film Studio, film website, filmmaker, movie, movie theme, production, studio, trailer, video, video blogger, videographer, vimeo, youtube and another uses. Film Maker is a beautiful Drupal8 theme perfect for film studio, film production, filmmaker center, Vlog sites or any kind of film website. With super clean and modern design, this theme will help you to do marketing for your products or reputation. From the very first glance, you can see an impressive big slider at homepage created with the premium MD Slider, which is included in the theme for free. The pro Awecontent module provides you with deep and powerful capabilities to shape and customize your website with powerful yet simple drag&drop function, no coding knowledge required!. Upon installing, you are offered 3 different homepage variations, 2 film layouts and 3 director & crew styles. With Film Maker, you can choose the best look for your blog because the theme comes with a large collection of blog layouts, even several blog video pages, all are carefully crafted. Other necessary pages such as History, Services, Gallery, Contact and more are also included. It has a responsive interface so that you do not need to worry if your website looks different on mobile from desktop PC.